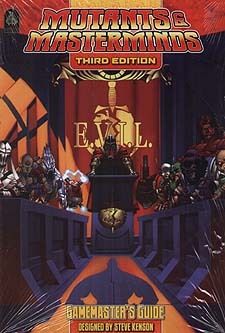 Detailed information on how to create, design, and run villainous foes for your M&M series, plus an entire chapter of evil plots, and more than a dozen ready-made and detailed villain archetypes of different themes and power levels, from the Assassin to the Vampire. More than villains, you'll also find archetypes for minions, monsters, and supporting cast characters. Need a scientist, crook, robot, zombie, or dinosaur for your next adventure? They're already detailed for you! Not just foes to fight, but challenges for heroes to overcome, from disasters to deathtraps. The detailed challenge system allows you to describe endless perils for your heroes! New rules options and systems, including how to modify the M&M system for other styles of play, mass combat, and more. ... plus nine fully detailed and ready-to-use Lairs, complete with maps and game information! With the M&M Gamemaster's Guide, running your own Mutants and Masterminds series has never been easier.